This week, Cirrus Design finally took off the wraps that had veiled “The-Jet”, their entry into the VLJ horse race. The $1.2 million USD personal jet will haul five adults roughly 1,000nm at 345 mph, with a single engine creating the power. As a HUGE fan of Cirrus, I have yet to catch “The-Jet” fever, and with such dreamy specs at such a reasonable price and looks to kill, it certainly isn't the airplane itself. No, I have to say, I believe my lack of drool is caused by the lackluster name. I am sure there was major league debate over the name of The-Jet in the Board Room at Cirrus. Suggestions must have poured in from the marketing and sales teams, from the people on the production floor, from the engineering team, and especially the front office. Now that Cirrus has taken their new jet's aerodynamics down the same road as Beechcraft's venerable V35B or the one-off Williams V-Jet II, they should have capitalized on the single design element that will set their VLJ apart from all others in the market...but they did not. They settled on a name that fails to generate the energy or excitement this new aircraft design deserves. Don't get me wrong, I will forever be a Cirrus fan and will cherish my first ride in the The-Jet. Read that last sentence out loud...the name doesn't even roll of the tongue with ease. In a story headlined “The iPhone of Aviation”, Karlgaard wrote “In your lifetime, what new products have completely reinvented their category and blown you away personally? I would put the Apple Macintosh, the BlackBerry, and Cirrus airplanes in this category.” He made the case that their new jet will certainly change things in the VLJ market. Karlgaard writes that Cirrus has taken close to 200 deposits at $100,000 each, all refundable until 60 days prior to the actual build on your jet begins. 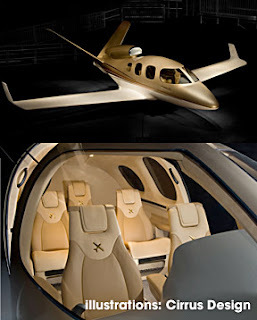 Cirrus should have a prototype in the air in 12 months, with FAA certification and customer deliveries coming in 2010. Can't wait to ride in a CDV, or maybe a C/Jet, or even a SRVJ.